1am - Little Scampy carries only one propane tank. We ran out of propane in that tank on New Year's eve. And had to go out late at nite for a propane fill-up! We had a Team Meeting this morning. The subject of this meeting was to determine Scampy's present condition. We took a roll call. Everybody was in attendance! Of course, Little Scampy was there. MsTwayler, Mr. Dometic, Baby Boid, Little iPhone, MacAir, MrSunny, MrWave3, Jack and last but not least - Little Honda. Well, after nearly everybody had their say, it was moved and seconded that Little Scampy is 100%! He is now able to go anywhere and stay as long as he wants to stay without any hookup! This means that we are not going outside and will stay inside MsTwayler all day. We are doing a winter cleaning! Going through every nook and cranny. Throwing out unneeded stuff. Putting things into order and the right place. In general, putting everything into apple pie condition! Yesterday we went grocery shopping at Smart and Final. S&F has come to be our favorite grocery! Their meat department has Weekly Specials of which I take advantage. My favorite is the steak special which often goes on all week long. Yesterday, I brought home three 1" thick rib eye steaks. One steak makes 3-steaks for me! They are sooooo BIG! 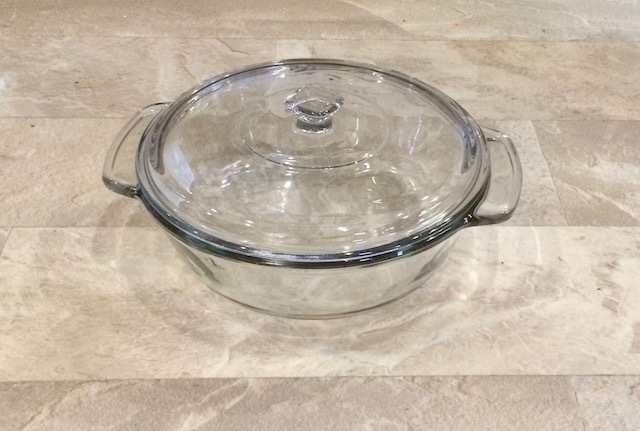 We also bought an Anchor Hocking covered dish. Now we are able to prepare a brisket pot roast! Cousin Jacky gave me her secret brisket recipe. I can't wait! My father and mother both were amazing musicians! My father was successful at almost anything physical that he tried to do. For example when he was in high school the music teacher was trying out students for the school band. He gave my father a flute to try out on and he just played it. A few years later, as an adult, my father played in the Los Angeles Philharmonic Orchestra. When my mother was three years old, she heard a neighbor playing the piano. Her father, my grandfather, saw my mother listening to the neighbor and pretending to play the piano on the porch railing. On a hunch, my grandfather took my mother to the next-door neighbor who had been the piano and asked if my mother could could try to play. She just played it. She just seemed to know where her fingers should go. All her life, my mother played songs for anybody who asked. She did not need music. She could play anything by ear. We always carry a couple of those bottles in case of emergency. Tell me OAT. Do you connect your 1-lb propane tank using the same kind of fitting that we Blogged about? Amazon has brackets to hold 2 20# LPG tanks. Shouldn't you invite Mr. Honda Fit to the meetings? He has an important role to play. I'm adding Little Honda to the list in my Blog post right now! George, you are a character. Sometimes I think you have gone off the deep end but then when you lucidly express yourself, I realize it is just what makes you George. When I first began Blogging in 2003, and named my equipment [ie; MrDometic=refrigerator] I received the same feedback as your comment from Readers. But years passed, and those same Readers got used to my antics! This naming and talking to equipment came from my times as a young father. My kids liked my stories and begged me tell them. I would make up stories about things that we could see from our backyard. One story that that got repeated tons of times, was the one about: "The Eat Me Gleeders!" The Gleeders lived on a distant hill which was actually a landfill. The kids could see the vehicles moving on that hill, but could not tell what they were. Too far away! So, I made up stories about those mysterious moving things and called them, "Eat-Me-Gleeders." Good for you Tioga George -- it's hard to get everyone to agree. You are an excellent team leader! Oh Darling George - I've read your posts for so long, and while I don't agree with your politics I also don't care that you post/share them, or that yours don't agree with mine. My heart is big enough for our differences. You are SO helpful, SO charming, SO engaging, and always, always I learn from you. I just wanted to pop in now to tell you that and how much I LOVE your posts - your "antics" and how you embrace life! You are a gift to all of us, and I for one enjoy unwrapping each daily missive. It seems to me that President Trump should not be responding at all to anything that his critics are doing or saying. He is much too angry. Too combative. He should be talking softly. And be a gentlemen. He is the President, for goodness sakes. Act Presidential. 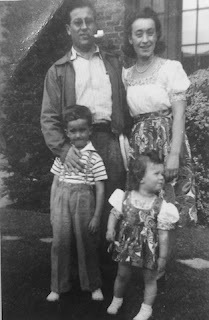 George, what a wonderful picture of you, your sister and your Mom and Dad. I love old pictures. You certainly take after your Mom! My Mom [she loved for me to call her Mommy] loved me so much. She was a very giving lady. Have you seen the 40# propane tanks, George? They look like they are about the same diameter as the 20# tanks and are taller. Maybe one of those would fit on Scampy. 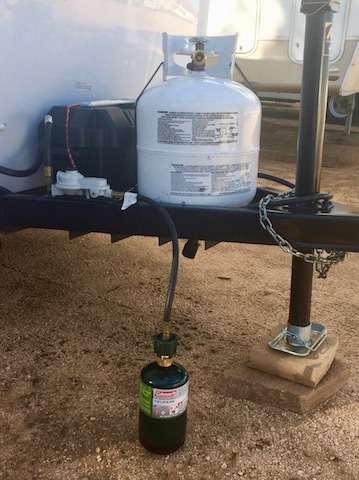 If there is enough height to fit the 40# tank this should fit on the same footprint and use the same brackets as a 20# tank but give you twice as much propane.